What can you do with a hula hoop and a bunch of tacos? 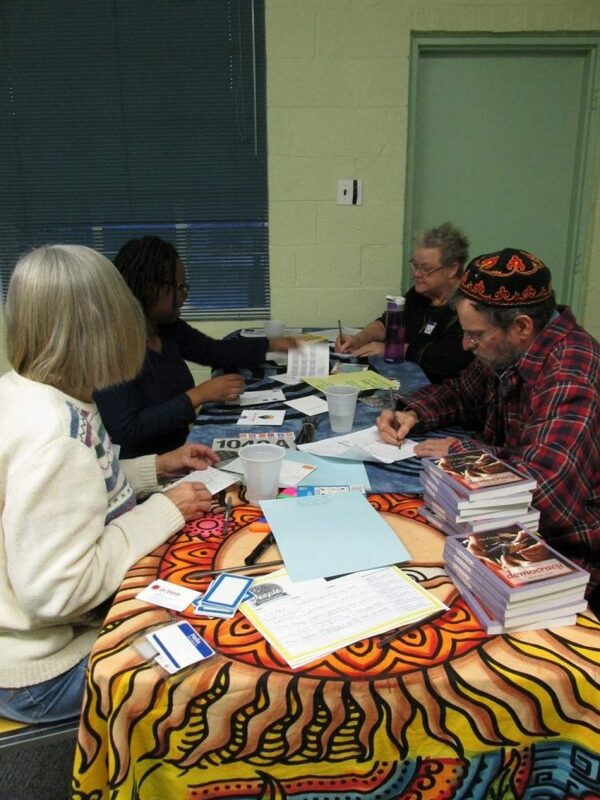 They were integral components to We the People’s most recent community meeting about education. Dedicated community members opened up real dialogue in plain language about education policy. One community member offered to do research, another offered to help secure food, and everyone suggested a friend they could bring. We began by telling our stories of why education matters to us over tacos from a locally owned shop. Two women talked about math teachers who pushed their limits of understanding and helped them advance in grades. Several of us had stories of English teachers who stayed late to keep us dedicated to our writing. One man talked about getting a minor in physics solely because of one dedicated professor. We talked about how we are each the product of the public school system, and the threads of experiences we had in common. Then we focused on two proposed bills that have been sent to congressional committee since the recent administration change: H.R. 610 and H.R. 899. The first bill proposes to distribute Federal funds for elementary and secondary education in the form of vouchers for eligible students. H.R. 899 intends to eliminate the Department of Education. It can be hard to imagine what life would be like with certain policy changes. One way that we can learn together is through a simulation, or, a game. We began the policy discussion using a hula hoop, and we held it up with one hand each. One part of the hula hoop was labeled in bright clear letters “LOCAL PUBLIC SCHOOL.” All around the rim were labels of public school programs such as “English as a second language,” “nutritious breakfasts and lunches,” “arts and music classes,” etc. We discussed that if H.R. 610 passed, there would be people in our circle who represented wealthy families that could choose to opt out of public schools and, in effect, take their taxes with them by using vouchers at other schools. 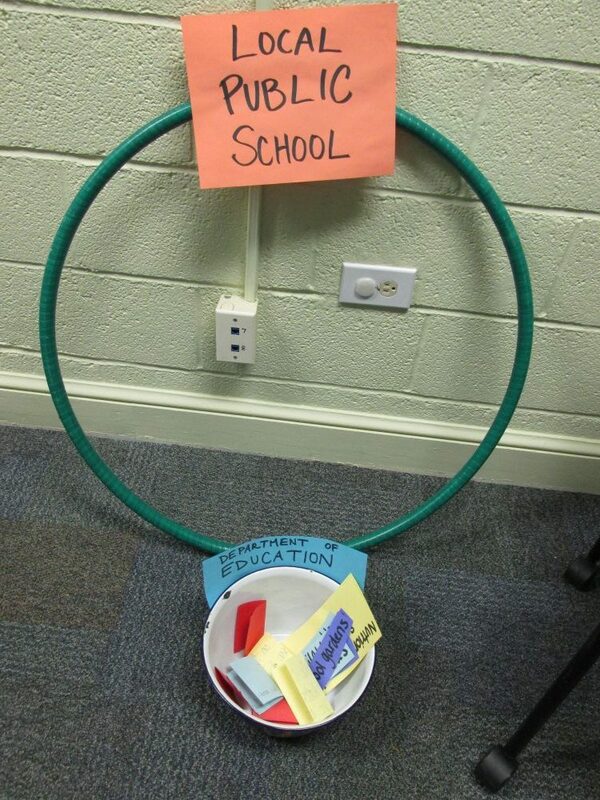 Each time a person let go of the hula hoop by leaving the public school system, one or two school programs disappeared. Finally, one of our volunteers was unable to hold the hula-hoop with his one hand and there were not enough programs to make the school a good learning environment. This represents how the voucher program not only takes away from our public school funds, but further separates wealthy and middle class students from working class and low-income students. It creates a bigger gap between their education and opportunities. Vouchers might sound like a helpful idea, but it only works for people who have the money upfront to choose a private or charter school. Many expressed frustration that this bill is referred to as the Choices in Education Act, because it would leave most of us without any choices at all. For the final chapter of our meeting, we looked at a power map I’d drawn up with the help of one of our community members. We learned that both of these bills have been sent to the House Committee on Education and the Workforce. North Carolina’s very own Virginia Foxx is the chair of that committee, and Alma Adams from the Charlotte district is a sitting member. Walter Jones from North Carolina co-sponsored HR899. We sat around the table together, munching on taco leftovers and drinking sweet tea, to write these representatives about what we need them to do to keep public education fully funded. We left with a sense of power, talking about what we could do together next and how best to share this information with our loved ones. We cleaned the room, walked each other to our cars, and agreed to meet again. The hula hoop showed us how we can come together, but also how it needs many of us holding on to keep it airborne. Public education is under attack, and we must find ways to fight back and make our voices heard. We the People: Working Together recently held its first 2017 Monthly Community Meeting – Let’s Discuss Healthcare. In these meetings, we focus on issues that community members identify and develop plans of action. We ground ourselves in real life experiences and build bridges to the policy realm by making research accessible and political leaders reachable. We transform power by utilizing understandable education. The population of Swannanoa, North Carolina is roughly 5,000 people. When you drive through the old streets, you can see where the Beacon Blanket Factory used to stand. A warped wire fence outlines the empty lot like parentheses, an old reference to tell the story of the town’s history. Around the town, the houses are brightly decorated with flowers sprouting out of the sunken brick facades. An occasional dog barks, or ventures out through a boarded up porch to run up and meet us. Next to the only park and playground in town, the library stands as it has for 65 years. We arrived on Saturday with a donated quiche, two gallons of sweet tea, and a couple of pizzas to feed however many community members could attend the meeting on healthcare. With Swannanoa, you never know if you’ll get four people or ten families to participate in a meeting. Nine of us gathered in the little brightly painted cinder block room in the library. Sharing lunch and stories, we began with who we are and why we’ve gathered together. In the introductions, two women realize they live in the same neighborhood. One currently lives on the street where the other was born. One man and woman realize they work for the same grocery store in different departments. I realize I went to school with one of the young men. Laughter breaks out when we find our patterns and commonalities, and just like that, we become a collective. We move on to introduce the idea that healthcare applies to all of us. We firmly state that it’s a nonpartisan issue for us, and that no matter which side of the aisle you sit on, you’ve got to bring all your health and sickness with you to the discussion. We heard both criticism and support of the Affordable Care Act (ACA). One woman stated it saved her life in response to another saying the “whole thing is a mess.” Folks listen to each other, call each other by name, when only an hour or so before they were strangers. I was touched by how personal everyone was with their sharing. More than half of us disclosed our pre-existing conditions that might now risk our ability to obtain coverage, several people discussed parents dying and leaving behind medical bills, and one person discussed what it’s like to be on disability. We agreed that everyone should be able to get the medicines and services that can save their life. After we created community and shared challenges with healthcare and access to medical services, we introduced some facts. We put together an interactive activity where folks guessed who most is at risk from the repeal of the ACA. We talked about why the majority of people (82%) at risk are working families. We talked about how just over half of those at risk are white people, and why the room assumed whites would account for a lesser percentage of those at risk to be uninsured. With the energy of our own knowledge, and some statistics, we created our action steps. We presented some sample scripts for phone calls and letters to let our legislature know how we feel about the changes they’re making to our healthcare. We gathered together around the phones, taking turns calling and sharing our stories. Because we called on a Saturday, we left messages. We talked as we drafted letters together on beautiful, different pieces of stationary, sure to catch the eye of staffers in Senator Burr’s office. We talked about other ways to make a difference through visits when he’s in his office, addressing the committees that make decisions about healthcare, about calling regularly and about what it means to be at a point of political transition. We closed our meeting by asking each participant to name someone they can invite to the next gathering and something that brings them hope. As a part of our monthly commitment, we set up our meeting on March 23rd to focus on education, since this was another huge topic of interest. The cycle continues, building broader and broader as we bring in our friends and neighbors to each next meeting. It is a powerful time to be doing election work. When we ride out to the communities, there is a merging of fear and excitement. We round the unpaved roads through the Blue Ridge Mountains, rural Appalachia full of reminders that there was once a thriving industry here. We pull up to the mobile home park, or brick duplexes, or cluster of apartments, and the memories play out. I think of the grandmother who brought me in the home, fed me, asked me about my family while registering her sons to vote and holding her grandchildren. I think about the man who warned us to not go to the yellow house, “because he always answers the door with a gun.” I think of the high school student who isn’t a citizen, but took every educational pamphlet we had to share with her friends on the bus the next morning. I wonder what today will be like. The kids in the neighborhood know we’re not from there, but they’re the first to approach us with smiling faces. Once, there were two young girls playing with a large cardboard tube in the street as we rounded the block. They shouted from across the way asking us what we’re selling and if we already went to their houses. 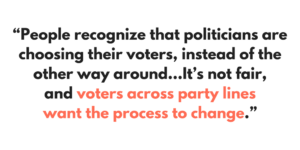 We explain we want to help people vote. That we want to help people make changes in the neighborhood and work together. They perk up and drop their toy to walk up to us. They ask, can they help? So we walk through the Habitat for Humanity Houses with two small girls, creating a gaggle of four young women between us. The girls practiced saying “we can help you with your voting rights” and still ended up saying “we are selling newspapers.” It kept the smiles on our faces, and door after door opened in the community. People kept the door open when they heard that we are nonpartisan, and were coming back to the same neighborhood for the third year in a row to make sure the community is able to voice its needs. They shared their opinions and filled out our surveys when we presented materials that their neighbors helped us create. They gave us their name and contact information when they heard that we can help them register to vote and get out to vote, but our largest goal is to follow up with them after the election when we continue voicing community concerns year-round. It helps me to think of those young girls, excitedly joining us to talk with their neighbors. There is something about rural, Southern towns that feels both very connected, and isolated. People are more likely to shout across the street and ask what we’re doing, but much less likely to integrate with folks they don’t know or aren’t from the neighborhood six generations back. And every time we return to the neighborhood, we become a little more recognizable. As a small nonprofit, we did not kid ourselves that we could knock on a million doors and turn out a record-breaking number of voters. But, North Carolina did break records, and we were a part of that. 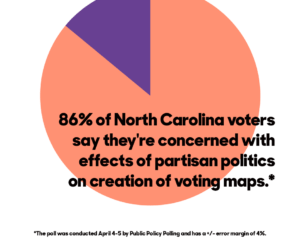 North Carolina was called the “the key battleground state of 2016.” What would this have meant if the 2013 “monster laws” had stayed in place? One of the most contested states in the country would have been blocked from representing its electorate. 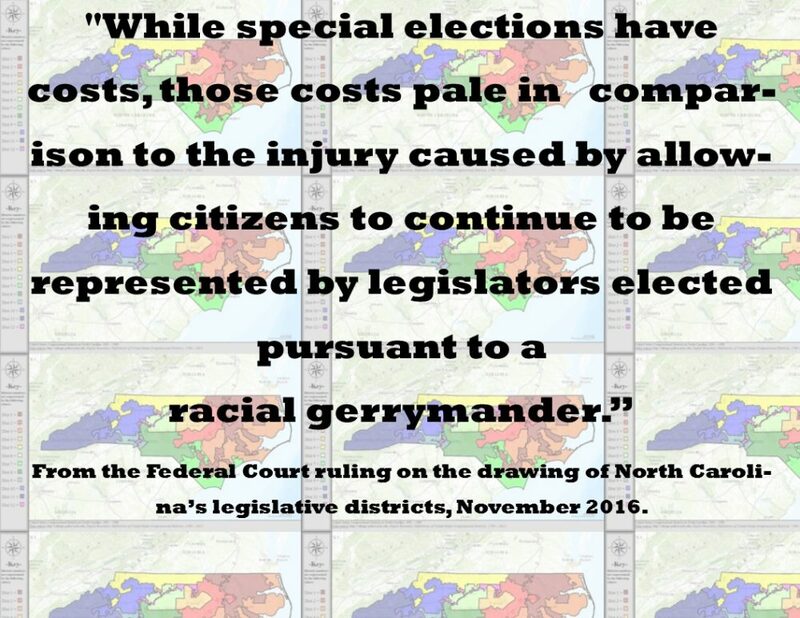 Just this summer, federal judges overturned the voter suppression laws, in part because they were cited as disenfranchising African American voters with “surgical precision.” With the voter protections that we won back, there were 3 million votes cast before Election Day during Early Voting, a record-breaking number for our state. We will keep fighting to stay truly representative in our vote, so that power comes directly from the people. It’s a long journey to reach folks, and as Dr. King showed us, “the arc of the moral universe is long, but it bends towards justice.” At Spirit in Action, we believe in continuing that long road together. We don’t change the way people think and feel by stating facts at the door, by demanding specific actions for change. 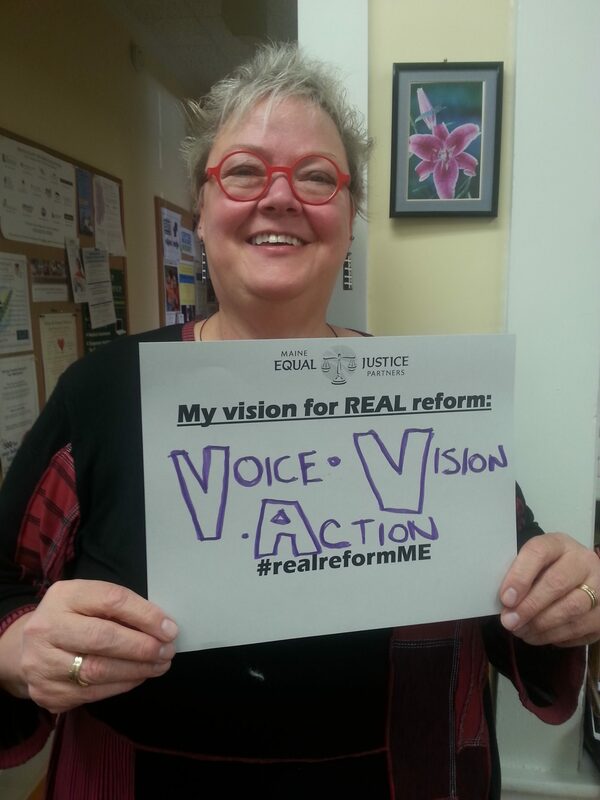 We facilitate transformative relationships and popular education which can ultimately transform what governmental representative power means in our communities. Lia Kaz currently serves as the North Carolina Community Organizer for Spirit in Action’s We the People: Working Together (WtP) project. Through the WtP project she organizes in low-income, rural communities across Buncombe County to empower civic engagement. She has a Bachelors degree in Social Work and won the Alton J. Pfaff Award from Warren Wilson College, which recognized her as the graduating student who most exemplifies the triad of Academics, Work, and Service. She currently lives in Asheville with some great roommates, and a perfect dog named Mona. Looking for a way that you can make a difference this season? Give a loved one the gift of hope for a just and equitable future through our seasonal #avoiceforall campaign. Take a look by clicking here to learn more.